Kevin Kelleher, 39, of Connaught House, The Esplanade, Bognor Regis, was discharged conditionally for three months and must pay £20 victim surcharge after admitting stealing nine bottles of Head And Shoulders and six bottles of Nivea Men worth £25 from Poundland, Bognor Regis, on April 26, 2018. Jacob Smith, 19, of Cheshire Crescent, Tangmere, was fined £50 and must pay £30 victim surcharge, £85 costs, after admitting failing to stop after an accident in which damage was caused to another vehicle in Barnfield Drive, Chichester, on May 14, 2018. He was fined £50 after admitting driving without insurance and fined £100 after admitting wilfully obstructing a police constable in the execution of his duty in Chichester on May 14, 2018. He also admitted failing to report the accident to police, no separate penalty. He was disqualified from driving for six months. Behrad Mohammadi, of London Road, Bognor Regis, was fined a total of £1,600 and must pay £30 victim surcharge, £1,000 costs, after admitting four charges of failing to comply with an abatement notice served by Arun District Council following nuisance caused by cooking odours from the extraction unit in Bognor Regis, on January 17, 19 and 26, 2018, and on April 19, 2018; and four charges of failing to comply with an abatement notice served by Arun District Council following nuisance caused by excessive noise from the extraction unit in Bognor Regis, on January 17, 19 and 26, 2018, and on April 19, 2018. Michal Bankiewicz, 25, of Winget Terrace, Spencer Street, Bognor Regis, was jailed for six weeks after being found guilty of drink-driving (120mg of alcohol in 100ml of breath) in Dorset Road, Bognor Regis, on December 25, 2017. He must pay £115 victim surcharge, £620 costs, and was disqualified from driving for 33 months. He also admitted driving without the correct licence and driving without insurance, no separate penalties. Matthew Wynn, 46, of Orpen Place, Selsey, was given a community order and must carry out 60 hours’ unpaid work after admitting causing harassment, alarm or distress to a police officer by using threatening, abusive or insulting words or behaviour or disorderly behaviour, with intent and religiously aggravated. He must pay £85 victim surcharge, £85 costs. He also admitted breaching a suspended sentence order, so the order was extended for six months. Callum Wallace, 21, of Pearson Road, Arundel, was fined £150 and must pay £60 costs after admitting breaching a community order by failing to report for appointments on June 6, 2018, and July 19, 2018. Natalie Jones, 28, of Garden Crescent, Barnham, must pay £50 compensation after admitting assault by beating in Bognor Regis on June 3, 2018; must pay £100 compensation after admitting a second charge of assault by beating in Bognor Regis on June 3, 2018; and must pay £50 compensation after admitting using threatening, abusive or insulting words or behaviour with intent to cause fear of or provoke unlawful violence in Bognor Regis on June 3, 2018. Kamil Taylor, 21, of Sturges Road, Bognor Regis, was fined £100 and must pay £30 victim surcharge, £85 costs, after admitting being drunk and disorderly in a public place, in York Road, Bognor Regis, on July 15, 2018. Jon Lee, 40, of Kathleen Gardens, Chichester, was given a community order with Rehabilitation Activity Requirement after admitting causing £250 damage to a light fitting, door and glass window in Chichester on July 21, 2018. He was also given a restraining order and must pay £200 compensation. 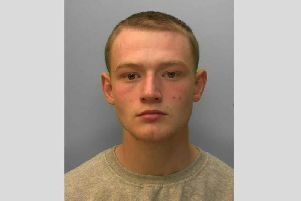 Bailey Chapman, 18, of Longley Road, Chichester, was given a community order with Rehabilitation Activity Requirement and must carry out 120 hours’ unpaid work after admitting four charges of assault by beating in Bracklesham Bay on July 14, 2018; stealing a bottle of wine from Central Convenience Stores, Bracklesham Bay, on July 14, 2018; and causing harassment, alarm or distress by using threatening, abusive or insulting words or behaviour or disorderly behaviour with intent. He must pay a total of £280 compensation, £85 victim surcharge, £85 costs. Daniel Knight, 38, of North Way, Bognor Regis, was fined £300 and must pay £30 victim surcharge, £85 costs, after admitting being drunk on a highway, in Rowan Way, Bognor Regis, on April 25, 2018. Jade Hall, 29, of Sudley Road, Bognor Regis, was discharged conditionally for 12 months and must pay £20 victim surcharge, £100 costs, after admitting two charges of assault by beating in Bognor Regis on June 6, 2018.